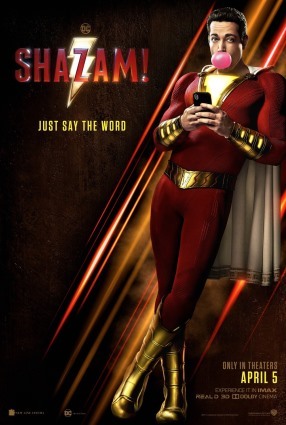 Shazam is a title that’s a little different from most of the movies that Marvel and DC have been bringing out as he is a much older character than most of the ones that have been populating theaters lately. While most of Marvel’s heroes (with the exception of Captain America) are the product of Stan Lee’s work in the 60s, Shazam is more of the generation of 1930s heroes like Batman and Superman. Unlike those iconic heroes however, Shazam (I won’t muddle things by referring to him by that other name) got caught in some legal shenanigans between his publisher (Fawcett) and DC and as such he didn’t really gradually evolve with the times and actually disappeared from shelves for a while before DC ended up buying him and bringing him back in the 70s as a rather nostalgia driven property. So we’re dealing with a rather old fashioned character still rooted in pulp iconography and undiluted by some of the more cynical ideas that even Superman has had to engage with. I bring all this up because, in some ways, this new film adaptation of the Shazam property seems interested in embracing some of the cheesier aspects of the character. They do nothing to change the costume and they certainly play up the “child in a superhero’s body” aspects of the story. The odd thing is, the hero himself and some of the related aspects of his powers like the wizard of the cave are in some ways the only aspects of the film that are really trying to embrace that camp value and a lot of the other elements of the film are updated and adapted in more conventional ways. Billy Batson has been aged up a bit and rather than being some kind of “Gee Whiz!” kid out of a Golden Age comic book he’s a somewhat streetwise and wounded from his abandonment by his mother. It’s a pretty good updated actually and I found myself fairly entertained just by his non-hero demeanor and with his integration into the foster family. The problem is that this version of Batson seems kind of removed from the “Big” routine that Zachary Levi is doing, which would seem to line up more with the personality of the traditional Billy Batson (or perhaps the MCU’s Peter Parker) than the moodier version of the character depicted here. On top of that, a lot of the action and filmmaking here is not necessarily adjusted to match the cheery demeanor of the superhero at its center. I was kind of expecting this to be more PG than the average superhero flick but it turned out to be about as violent in some scenes as other DC movies like Batman V. Superman: Dawn of Justice and Suicide Squad. The guy who directed it is probably most famous for making horror movies and you can see some elements of that here and I think he may have been an odd choice for a movie that would seem to call for more of a Spielbergian childhood whimsy. So, when it comes to Shazam! I’m left to come back to what I was saying earlier about this being an over-saturated superhero market. I’ve seen a lot of these movies recently and frankly I probably would have skipped this one if I didn’t essentially get into it for free as part of a ticket subscription service. We’ve just reached a point where it’s kind of hard to surprise people with any of these movies. Stuff that could have felt original ten years ago like, say, a teenage superhero immediately trying to show off their powers on Youtube, might have seemed like a unique take ten years ago but now we’ve seen that scene in everything from the movie Chronicle to the show “Heroes.” This one might have a little more than usual going for it and I did mostly enjoy watching it but at the same time I found its tonal messiness to be a bit hard to forgive, and in a world where there are so many different options for super hero cinema it’s hard to really get excited for anything that doesn’t really go above and beyond. Two year ago I found myself in the rather unenviable position of being one of the few people in the world who didn’t much care for Jordan Peele’s Oscar winning horror film Get Out. At the time the one and only negative review of that movie on Rotten Tomatoes was written by noted provocateur Armond White and to my general bafflement the movie became a giant box office success despite its rather unconventional appeal. Still, I’m rather proud of that review. I finally had a fairly original take on a movie and I think I expressed it pretty effectively and I haven’t really waivered at all in my take on the movie. That said, with me going against the grain of popular opinion like that I feel like I spent a lot of time focusing on the negatives of the film when there were in fact certainly aspects to it that I found impressive. 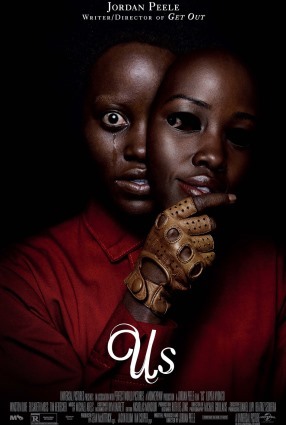 It was certainly a different approach to the genre and Jordan Peele was certainly a voice I wanted to hear more from, so despite my issues with that debut I was looking forward to his follow-up film, the interestingly titled Us. Us focuses on the Wilson family, which consists of Adelaide (Lupita Nyong’o), her husband Gabe (Winston Duke), their daughter Zora (Shahadi Wright Joseph) and son Jason (Evan Alex). As the story begins the family is headed to Santa Cruz, where they have a vacation home, but Adelaide has come to sort of dread this trip because of a traumatic experience she had as a young child in that area where she wandered off into a house of mirrors and encountered something that scared her to the point that it took her years to recover. She does not, however, have the easiest time explaining this to her husband, who is looking forward to meeting with his friend Josh (Tim Heidecker) and his wife Kitty (Elisabeth Moss). Things mostly seem to be going normally for a while until suddenly at night the family notices a group of strange people standing out in their driveway looking rather threatening. Soon they discover that this family is a sort of mirror image of themselves but with different and more violent personalities and ready to menace them over the course of the night. Unlike Get Out, which was more of a Twilight Zone episode than a true horror film, Us is unquestionably meant to be a full on work of horror. Specifically it’s a home invasion movie, at least in its early stages, which is significant because that is a sub-genre that’s been rather prone to rather loaded political subtext suggesting a sort of invasion of middle America that needs to be fought back, often though gun ownership. Us isn’t specifically meant to be an inversion of that but it is worth noting. The family at the center of the film is African American, and I don’t think this is incidental at all but it is interesting that it’s not something the film’s screenplay seems to draw attention to at all. Had Peele decided to change directions and cast a white family at the film’s center I’m not sure that it would have really had to change any dialogue at all. Instead I think the film very notably draws attention to the fact that this family is distinctly upper middle class. They have a vacation home, the father rather prominently wears a Howard University sweatshirt through much of the film, and there’s an element of “keeping up with the joneses” in how they view their slightly richer friends with an understated but clear degree of jealousy. Of course that’s subtext, the really weird thing about Us is that the basic text of the film… kind of doesn’t make sense, or at least the twist doesn’t if you’re looking at it literally. I gather from watching the movie that, prior to Red changing things, these tethers are supposed to be constantly mirroring every last movement of their counterparts above. Which is something that would seem to result in a whole lot of walking into walls. Think about it for just a couple minutes and you come up with questions like “What happens if you fly to the opposite coast? Do the tethers follow? Do immigrants have tethers? How do the tethers end up with the exact same mates as their counterparts above and pass along exactly the right genes to produce children identical to their clones on the surface?” Beyond that there are other questions, like where they get their jumpsuits or why they think they’ll be able to take over a country with 1.2 guns per person using only scissors. At a certain point you kind of need to invoke Argento style “nightmare logic” to excuse this stuff, and how willing you are to do that will probably determine how much you’re going to like the movie. I’m normally pretty quick to have my attention derailed by plot holes and logical inconsistencies like that but I must say I found myself oddly willing to go along with Us. I think that’s partly because it seems to be deliberately existing in a sort of symbolic place in a way that mainstream horror movies generally don’t. That is the main thing that differentiates it from Get Out, which was also essentially an allegory, but a very clear allegory when that allegory started to stopped lining up as much as it thought it did in the second half it sort of lost me. This one is more open for interpretation and that gives it a certain leeway that I wasn’t inclined to give Get Out. It also frankly just works a lot better as a visceral thriller rife with intense pacing and visceral horror imagery and that alone puts it over Get Out even if I didn’t have other issues with that movie. Leading up to the release of Captain Marvel I was jonesing for MCU content like I’d never jonesed for it before. When the MCU was first starting I was kind of indifferent to it and didn’t see the big deal and during its “Phase 2” I went into each movie not really sure if I was going to get a winner like Captain America: The Winter Soldier or a underwhelming product like Thor: The Dark World. But ever since the release of release of Captain America: Civil War (the official start of (Phase 3) they’ve been on a pretty unprecedented win streak. They started to finally give their movies good villains, they managed to make the franchise crossovers feel genuinely fun rather than advertisements, and they seemed to have found the right formula to allow filmmakers to add their own signature styles to the films while functioning within the house style as well. Even some of the lesser movies during this span like Doctor Strange still had clear saving graces like that film’s trippy visuals or and the brand clearly reached a zenith of success last year with the release of the Oscar nominated Black Panther and the worldwide blockbuster Avengers: Infinity War. Oddly though despite releasing three movies last year they put out all of them in the first seven months and as such we haven’t gotten fresh product from Marvel in over half a year. Any other franchise and that would seem normal but we’ve gotten pretty used to out MCU fix and after what feels like a long wait we’re finally getting it in the form of Captain Marvel. Captain Marvel is the first prequel in the MCU, being set in 1995, but that isn’t apparent right away because it begins lightyears away on the planet of Hala, the homeworld of an alien species called the Kree. Our hero Vers (Brie Larson) is a member of a Kree taskforce being led by her mentor Yon-Rogg (Jude Law) who are acting in a war against another alien species called the Skrull, who can disguise themselves as other people. When a mission goes wrong she finds herself on a Skrull ship being interrogated about visions in her head of someone she doesn’t recognize named Wendy Lawson (Annette Bening), she escapes her captivity and in her escape she finds herself on Earth. There she meets a young agent with two functional eyes named Nick Fury (Samuel L. Jackson) and quickly learns that four Skrull agents also followed her to Earth. She and Fury must find out the significance of Lawson before those Skrull agents do. Give Captain Marvel this, it’s not structurally formulaic. That’s not to say it’s doing something truly radical here but it doesn’t necessarily follow the same predictable superhero origin path, which might partly be owed to the fact that the Captain Marvel comic book character has kind of a weird and convoluted history in a way that someone like Doctor Strange (whose origin was basically a redo of Iron Man’s). That isn’t to say that the things it does differently necessarily work for it. The way the film opens in the middle of this science fiction world that’s never fully explained before dropping the audience in the middle of a weird alien war is pretty disorienting and the film takes a while to find its footing. Once the film finally (literally) comes to earth things do improve but even then it still takes a while to really come to understand our main protagonist and what her deal is. Things also improve when Samuel L Jackson shows up and a sort of buddy cop dynamic emerges between him and Captain Marvel. Jackson is being digitally de-aged through the whole movie and the technology behind that is quite impressive. Even more importantly, being de-aged seems to have somewhat invigorated Jackson and snapped him out of the usual “angry old man” shtick that he’s been indulging for a while and he becomes a rather pleasant presence in the film. Given the discourse around this being the first Marvel film about a female protagonist I was a little surprised that the film didn’t do more to lean into the whole feminism angle. In fact I kind of wish they’d either done more of that or less of it because female empowerment never really feels like a consistent theme in the film and the moments of it that are thrown in at times seem to come out of nowhere. We’re told that as a human our hero did deal with some gender discrimination in the air force, but given her amnesiac status at the beginning of the film that’s not really a foundational aspect of her character and instead her status quo comes in the form of fighting on what appear to be a rather egalitarian Kree task force. At times the film seems to sidestep this by making her status as a human among Kree stand in as an allegory for being a woman among men, but again, she doesn’t know she’s a human until the very late in the timeline of all this so positioning it as a lifelong struggle again seems a bit strange and the decision to play No Doubt’s “Just a Girl” over a climactic fight sequence feels rather unearned as a result. I think what ails Captain Marvel is simply weak source material and a lack of vision of how to bring that source material to the screen. Marvel has spun gold out of second rate comic book characters in the past but when they’ve done it they’ve had people like James Gunn or Edgar Wright via Peyton Reed to find interesting ways to make it happen. Captain Marvel was made by the directorial duo of Anna Boden and Ryan Fleck, who are good filmmakers but their previous work like Half Nelson and Sugar were realist dramas and there isn’t much in their background to suggest an interest in this kind of comic book action movie. In the past when Marvel has gotten unexpected talent like that to make these kind of movies they’ve done it by bringing in comedic directors like Jon Favreau or Taika Waititi to inject the movies with levity, and I’m not really sure what Boden and Fleck are bringing to the table. The film they’ve made kind of feels like the other Marvel movies but without really much of its own twist on the form. It’s funny at times, but never as funny as something like Thor: Ragnarok, it’s got some nice 90s needle drops, but nothing as impactful as anything in the Guardians of the Galaxy movies. And as a straightforward action movie it also comes in a little short, partly because its hero has kind of boring powers and partly just because they’re not particularly well edited. None of this is to say the movie isn’t enjoyable though. Looked at outside of the high standards that Marvel has set for itself lately the movie does have enough things going for it to be worth a watch. It’s probably Marvel’s worst movie since… the first Ant-Man, or maybe Avengers: Age of Ultron, but even a second rate MCU movie is still going to mostly be decent. The Incredibles is certainly not the best Pixar movie but it’s almost certainly one of their most important ones. It’s the first movie where the studio was willing to work with human characters in earnest and it was also the movie where they started to expand their scope and aim their sights on slightly older audiences. That movie still resonates but it was released way back in 2004, which in the world of animated movies is kind of an eternity. That’s fourteen years, meaning that a kid who saw it in its original release at ten years old would be twenty four now, and yet in this whole timespan Pixar never saw fit to make a sequel, which is odd given that it seemed more suited for one than a lot of the other movies they seemed to have no qualms about mining for additional installments. After all, the first film ended on something of a teaser for future installments and given the film’s debt to comic books, which are an inherently serialized medium made The Incredibles seem like perfect franchise material. Part of the delay might simply be the aversion that Pixar once had to unnecessary sequels, but that certainly hasn’t been part of their philosophy in a good ten years. It also might have simply been a matter of working around director Brad Bird’s schedule as he branched out into live action filmmaking with varying degrees of success. Really though I think a big part of why there was a delay is that the first movie benefited greatly from coming out before Hollywood was regularly making high quality superhero movies and they were waiting in vain for the superhero genre to die down a bit in Hollywood, but that clearly wasn’t happening anytime soon so they decided to finally give it ago with this year’s The Incredibles 2. 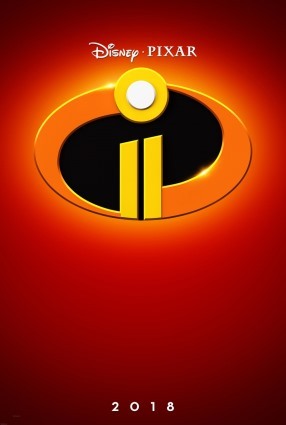 This sequel picks up almost instantly from where the original film left off, with the moleman-like supervillain The Underminer (John Ratzenberger) emerging from the ground and trying to rob a bank, leading The Incredibles along with Frozone (Samuel L Jackson) to launch an attack despite the laws against masked vigilantism still being on the books. While they do stop the attack the fight does leave a lot of the same collateral damage that got “supers” banned in the first place. However, one person is not outraged by this and that’s a billionaire named Winston Deavor (Bob Odenkirk) who has been a superhero enthusiast since the death of his father years ago. He calls Mr. Incredible (Craig T. Nelson) and Elastigirl (Holly Hunter) and offers to let them stay in one of his mansions if they work with him on a lobbying campaign to bring back costumed heroes. The catch, he wants this campaign to start slow and just have Elastigirl do the crime fighting at first given that he has less of a history of destructive fighting. That means Mr. Incredible is the one tasked with staying home and watching Violet (Sarah Vowell), Dash (Huck Milner), and baby Jack-Jack (Eli Fucile) whose powers are just starting to come into full bloom. Mr. Incredible says he’s game to do this, but in reality he kind of resents this turn of events and doesn’t really know how to cope with the domestic life. Of course he is self-aware enough not to complain about this to Elastigirl, who finds she has her hands full when a mysterious villain called The Screenslaver emerges and begins wrecking-havoc. Ever since the release of the original The Incredibles people have been debating whether the message as its center about what society owes to the exceptional people among them ultimately boils down to a sort of junior version of Randian Objectivism. This sequel doesn’t exactly continue down that path but it doesn’t exactly shy away from material that could be viewed as political. For instance there’s a story the Bob Odenkirk character tells at one point about someone who’s killed by an intruder as he calls for a superhero instead of dealing with the problem himself, which is disturbingly similar to the NRA propaganda about the dangers of relying on police instead of personal gun ownership. On the other side of the spectrum there’s some talk about the “supers” in the family having to hide their true selves, which could be seen as something of an allegory for gay or trans identity. But the plotline that most overtly and extensively deals with ongoing modern debates is the Mr. Incredible’s ennui at the process of being a sort of stay at home dad while his wife wears the pants… I mean costume… and Elastigirl’s own anxiety about trying to “have it all” instead of maintaining more of a work/life balance. This is a storyline that I suspect will annoy people who sit on both sides of the feminist divide. On one hand the movie certainly ultimately falls on the side of Elastigirl being perfectly capable of pursuing a career on her own and of not guilting her for her decision to do so, but on the other hand it feels kind of lame and regressive that we’re still doing the whole Mr. Mom thing in 2018 and the fact that Mr. Incredible proves to be this incompetent at keeping a house in order without the help of a woman does kind of reinforce the gender norm at play. Messaging aside, the way the film splits into a separate A story with Elastigirl tracking down the Screen Slaver and a B story with Mr. Incredible holding things down at home does lead to a bit of a clumsy and slightly TVish story structure for a lot of its runtime before things merge later on. What’s more each of these stories have their weakness. The Elastigirl story doesn’t have anything jarringly poor in it but it also feels a bit routine as far as these things go. The mystery about who the screenslaver is isn’t terribly compelling and the film doesn’t really do as much with the idea of a superhero going on a PR campaign as it could. The Mr. Incredible story by contrast feels a lot more unique in that you don’t exactly see every day but it did draw attention to one of the series bigger weaknesses: the Incredibles kids are not very well drawn out. Violet is a pretty cliché over-dramatic teenage girl and Dash is even more thinly drawn and doesn’t do much in the film besides get overly excited about stuff. He’s frankly kind of annoying. The movie also has slightly more clumsy animation than I was expecting from a new Pixar movie, possibly because the art style they devised back in 2004 was designed to work around the limitations of the technology of the time but which may be more of a stifling force today. I’ve complained a lot but the movie is actually a lot better than I’ve probably let on. In fact I enjoyed it quite a bit while I was actually watching it and it’s more when I look back on it that if feels a bit more flawed and insubstantial. What probably saves it are its action set-pieces and its sense of humor. It’s no secret that in terms of powers and to some extent the overall concept The Incredibles are basically a ripoff of The Fantastic Four and it uses this set of powers a lot more creatively than any of the real adaptations of that property ever have and the animation medium makes all the fights seem a lot more loose and fun than a lot of the action scenes in “real” super hero movies do even if they don’t have quite the same sense of spectacle that you get from seeing these powers in more realistic settings. The film also has a generally amusing tone and some of the comic elements like Edna Mode remain strong. Watched with tempered expectations the film is quite fun but the fact that it’s a movie fourteen years in the making kind of makes you expect a bit more than the film is really able to deliver on. It certainly isn’t going to have the impact of the original movie but I suspect it will leave most audiences satisfied enough. In the world of art cinema you sometimes get pleasant surprises and one of those pleasant surprises was the unexpected success of Paweł Pawlikowski’s 2014 film Ida. That film was something of a sneak attack; its director was respected but not necessarily a huge name and while it got some buzz at festivals it was largely over-shadowed by other movies. I didn’t even hear about it until I saw its rather striking trailer the week before it came out and new it was going to be something worth checking out. Even more surprising was that the movie was a hit, at least by the modest standard of subtitled film in the 2010s. Its $3 million take might not sound like a lot but if you exclude movies clearly marketed at immigrant communities rather than cinephiles its one of the twenty highest grossing foreign films of the decade, which is kind of awesome considering that it was a black and white movie about Polish nuns and kind of seemed to defy standard notions of commerciality. When he accepted the Best Foreign Language film Oscar that year Pawlikowski gently quipped “how did I get here, made a film… about the need for silence and withdrawal from the world and contemplation and here we are at this epicenter of noise and world attention. Fantastic! 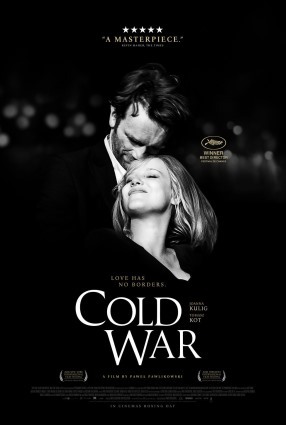 Life is full of surprises.” With the clout he earned from that film Pawlikowski has come back with another black and white film about life in 20th Century Poland called Cold War which has arrive with much more fanfare and higher expectations. Cold War begins in the Poland of 1949 where the post-war Polish People’s Republic has become firmly established as a Soviet puppet state. One of the things this new communist government apparently did was establish an academy of sorts to create a song and dance troupe that would bring respect to the music if the downtrodden proletariat peasants, and this is where our characters come in. Wiktor Warski (Tomasz Kot) is the musical director and conductor for this troupe while Zuzanna Lichoń (Joanna Kulig) is a young woman who auditions for the troupe and immediately catches his eye. Before long the two have started an affair and when the troupe finds itself touring to East Berlin Warski proposes that the two try to escape to the west. First and foremost Cold War just looks really awesome. Like Ida before it the film is in black and white and in the academy ratio so as to invoke the look of the European arthouse films of the era its set in. Experiments to imitate previous filmmaking eras like The Good German or The Artist often come off a bit gimmicky but Pawlikowski has really managed to make something that looks like the genuine article and seems aesthetically pleasing beyond mere nostalgia. Ida was of course a movie about spiritual exploration so it’s look perhaps invoked something more along the lines of a Bresson or Tarkovsky, but Cold War is more of an epic romance of sorts and takes the form of something like a European noir or some of Rossellini’s work in the 50s. Helping this illusion is that Tomasz Kot and Joanna Kulig both manage to have a very classical look, which is admittedly probably helped by the fact that neither of them are terribly well known in the English speaking world. The movie is, at its heart a film a relationship that’s rocky for both internal and external reasons. Sometimes they’re kept apart by the repressive society they live in, sometimes they’re separated by national borders, sometimes they’re separated by relationships with other people or even by incarceration but often they’re also often separated by their own dysfunction. At times this seems like a pair that are almost going out of their way not to be happy and I think part of the problem is that the movie feels a bit rushed at times. This is after all a movie that’s set over the course of more than fifteen years but runs a scant 85 minutes and this means that certain stages in their relationship have to be summed up in just a scene or two and the last development in the film feels especially rushed through. If you’re going to make an epic romance I don’t see why you wouldn’t want it to be a bit more epic in its length, Still the film’s style makes up for a lot and even if we’re only getting a taste of this romance it does still leave you with some of the emotion and when the film looks like it does that’s always just going to be catnip for film critics. 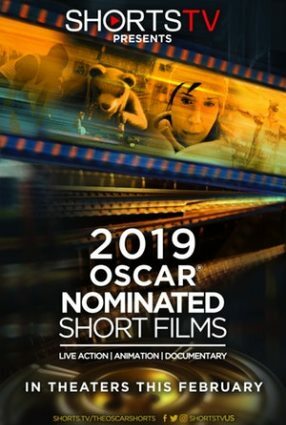 During the last two years I found myself forming something of a new end of year tradition for myself by going to see the Oscar nominated live action shorts. Unlike the documentary shorts (which are very easy to track down online and on Netflix) and the animated shorts (which are usually very short), the live action shorts seem to me to be the ones that really benefit from going to the package that gets put into theaters by a company called ShortsTV. These theatrical presentations have become increasingly popular over the years but could be in danger given that the short categories are probably going to be on the chopping block in the near future in the Academy’s unending quest to shorten its telecast at the expense of its integrity. That said, if they keep nominating classes of shorts like the ones this year that could hurt this little tradition as well. Personally, I’d say this is actually the best roster of live action shorts they’ve nominated in the three years I’ve been paying attention (with one notable exception) but they are decidedly not going to be for all tastes. All five of these nominees is rather dark and some are downright grim. Child endangerment is something of a running theme and audiences sensitive to such material may not find this to be a very fun evening at the cinema. Please note that when talking about movies with running times like this even talking about small plot points can be bigger spoilers than they would be when talking about longer works, so if you’re interested in actually watching these maybe be careful about reading. The first short of the package is probably the most conventionally entertaining of the five insomuch as its disturbing content fits well within the confines of the mainstream thriller genre and would not be overly noteworthy were it not in this company. The film, a Spanish production directed by a guy named Rodrigo Sorogoyen, begins with a woman in her late twenties and her mother walking into an apartment. You instantly assume that the mother is the mother of the title, but you start to reconsider that when you learn that the younger woman is herself a mother of a small child and the action really kicks off when we learn that this child has somehow found himself alone on a beach in France with his father (who he was vacationing with) having disappeared. The mother frantically tries to get as much information as she can from the child before his battery runs out and there’s a real kinetic charge to watching this mother panicking and doing her best to solve the situation. The film is also done largely in a single shot as it follows the two women around this apartment and incorporates some interesting surround sound elements as well, making it one of the most technically accomplished of the five. It’s big weakness however is that it ends abruptly with no real resolution to the conflict at its center. When watching it I had a hunch that this was meant to be a proof of concept and perhaps opening scene to a longer movie along the lines of The Vanishing or something and sure enough this director is currently working on a feature length adaptation. I’d be interested to see that version, but the way this shorter version ends just kind of makes you feel like you were tricked into watching a (very well made) trailer. Its Oscar Chances: Low. Some people might want to recognize it simply for being the most professionally made, but that ending is going to be pretty off-putting in general and for better or worse this just doesn’t feel like the film out of the five that will elicit strong reactions one way or the other. The next short is the first of two French Canadian live action shorts and both one of the best of the shorts here and one of the most disturbing, which is kind of saying something. The film concerns two children of about ten or twelve who are playing outside in the outskirts of a town and are playing a strange game amongst themselves involving various dares and “made you looks.” The two become increasingly oblivious to how dangerous this behavior can be as they wander into a cement mine and continue to play there. Unpleasantness ensues. That description probably makes the film sound rather trite but the film is really good at building tension and the sense of dread it creates is definitely intentional. Director Jérémy Comte clearly has both a command of his craft as well as a sort of perverse view of humanity that I’d like to see expanded on and he adds a little note at the end which I suspect some will hate but which I think does make the film go full circle in a dark but oddly satisfying way. Its Oscar Chances: In another year I would be a bit more optimistic about this one but a lot of people are going to come out of this bunch of films really sick of seeing children placed in danger and given that this movie does that most clearly they may take that frustration out on it. The third film in this presentation is another French Canadian film and is the only film of the bunch which doesn’t involve children or bad things happening to them. It’s not exactly a “happy” movie but in this bunch it feels like an oasis in a desert of misery. It involves interactions between a PCA and an elderly woman who lives alone in a house. At a certain point the old woman learns that the PCA is a lesbian married to a woman, which brings back memories of her own past being in love with a woman herself but having never been able to act on this because of “the times.” Ultimately there’s not a whole lot to the film, it’s certainly less eventful than the other four, but it’s reasonably well acted and constructed and I think director Marianne Farley would be well suited to making dramas on a larger canvas. Its Oscar Chances: This is sort of the opposite of Fauve in that I think it kind of benefits from the company it’s in. In normal years I would say it didn’t have a chance because it lacks anything to really make it stand out and stick in the memory, but this year it’s a total apple in a basket of oranges and could well be something of a protest vote in opposition to what the other films put their audiences through. The fourth and most controversial of the shorts is Detainment an Irish production set in England which takes another look at the Jamie Bulger murder, which if you’re not familiar with was a case that occurred in Liverpool during the early 90 where two small children kidnapped and murdered a toddler for reasons that appear generally psychotic. The film is largely a reenactment of the interrogation of these two children intercut with reenactments of the moments leading up to the murder. The film is just tasteful enough to not show the actual killing but it is certainly discussed in graphic detail. I will say that the acting in the film, especially amongst the two child actors, is very strong and I suspect that is a big part of why the film received the nomination. However, everything else about this thing seems completely misguided. The family of the real Jamie Bulger have come out against the film, which was not made with their permission. Personally I don’t feel that the making of any movie based on fact should need the blessing of an estate in order to be made, but if you’re going to do that you should at least have an important movie to show for it and this isn’t it. In many ways it falls into the same trap as Katheryn Bigelow’s Detroit in that it recreates a really extreme act of human cruelty while ultimately finding nothing to really say about it except to stare into the abyss, and that movie at least had the excuse of bringing attention to a lesser known moment in history, which is certainly not the case with the Bulger murder which is one of the most discussed cases in all of true crime. The final film in the package is Skin, an American film from an Israeli director which focuses on a family of white supremacists who are covered in hateful tattoos, listen to obscene music, and have no qualms about using grotesque slurs. They’re white supremacists of the worst kind, but they do seem to love their son and at least treat him well. The film does come close to the making the American History X mistake of making a critique of white supremacy which nonetheless gives more screen time to the white supremacists than to the ultimate message, but this problem is somewhat mitigated by the twenty minute format and by the fact that the characters rarely really articulate where they’re coming to these hateful views. Eventually the film builds to a vicious hate crime and then it transforms into a slightly more fanciful revenge scenario where the skin heads “get theirs” in an implausible but interesting way. The film works best if looked at as a sort of modern day fable, but I’m not sure that its conclusions are overly profound. Its Oscar Chances: Not bad, in fact I’m kind of reluctantly going to predict it simply because its finale stands out as one of the more creative moments in any of the films and because the film at least leaves the audience with some feeling that evil has been defeated by the end, which a lot of the other films lack. With the 2018 live action shorts we are faced with the limits of programing a block of short films simply through all the options being nominated for an award rather than through a more strategic selection. I’m going to assume it’s just a coincidence that most of the nominees this year are as dark as they are because I doubt any voters necessarily wanted it to turn out this way. I feel like almost all of these shorts would have been better served as the most serious film in an otherwise neutral festival block than played one after the other pretty much inviting comparison between them all.